There has been much comment about the role and place of journalists who are "em-bedded" with the US/Coalition forces in Iraq. MEETING RESISTANCE is a verité-style non-fiction feature-length film set in the streets, alleyways and ubiquitous teashops of the Adhamiya neighborhood of Baghdad. It enters the physical and psychological heart of the "insurgency" against the American occupation. 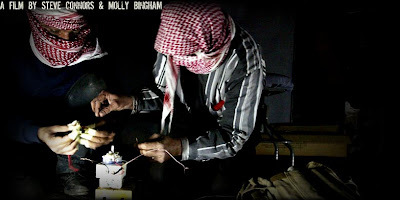 Photojournalists/directors Steve Connors and Molly Bingham spent ten-months among the insurgents there to create this exclusive, unique, and at once horrifying, compelling and insightful film about their lives, motivation, and goals. MEETING RESISTANCE focuses on eight "insurgents", each with his or her own tale and reasons for opposing the American-led occupation, yet all people who within days of the fall of Baghdad were arranging themselves into resistance cells, finding the money and weapons to fight against the American military. The film witnesses how they began to organize themselves, reveals why they have decided to violently oppose the occupation of the country, and hears in their words the underlying ideological foundations to their fight and how and why those have changed over time.